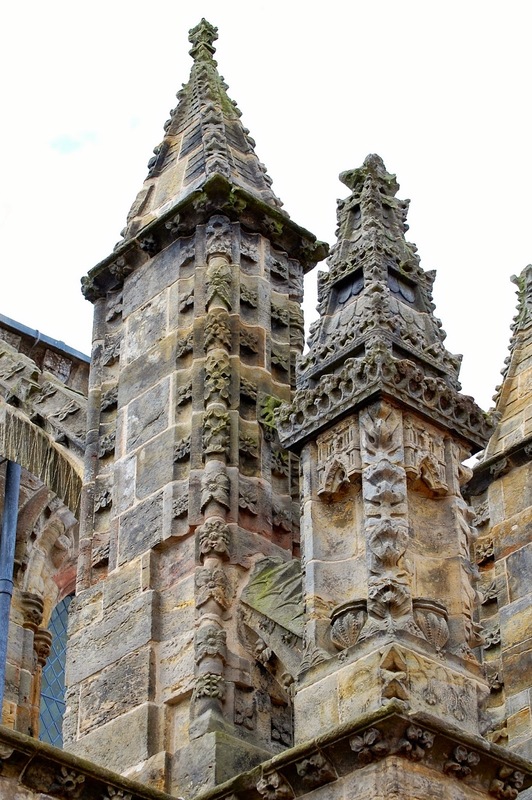 Rosslyn Chapel has the kind of history and mystery that makes me want to believe the conspiracy theories. I don't believe them. But I want to believe them because it's so much more fun to believe the Knights Templar and Freemasons are tied into the chapel and that secrets are buried underground and coded into the carvings on the walls. Rosslyn Chapel, on an appropriately overcast morning. The chapel was founded in 1446 by William St. Clair (the family is now known as "Sinclair"). Its general architectural plan seems to be based on the Glasgow cathedral, though much of Rosslyn Chapel was never completed. Some conspiracy theorists apparently argue that the plan of the chapel is based on the Temple in Jerusalem, but the architectural plans don't really line up even if they're twisted or distorted. Anyway, it's a small chapel — only 69 feet long and 42 feet high — with a profusion of stone carvings, both inside and out. Approximately 40 years of construction on the chapel largely ceased after William St. Clair died. View of Rosslyn Chapel on the opposite side, outside its wall. In the Victorian era, a small baptistry was tacked onto the western end of the chapel. I'm not a fan of it. Like most folks, I first heard of Rosslyn Chapel in The Da Vinci Code by Dan Brown, and first saw it in the film of the same name. The general conspiracy theory — though not necessarily what is described by The Da Vinci Code — is that the St. Clair family had historic ancestral ties to the Knights Templar, and when the Templars were destroyed by the Pope and French king Philip IV, some of the members fled to Scotland and took refuge. 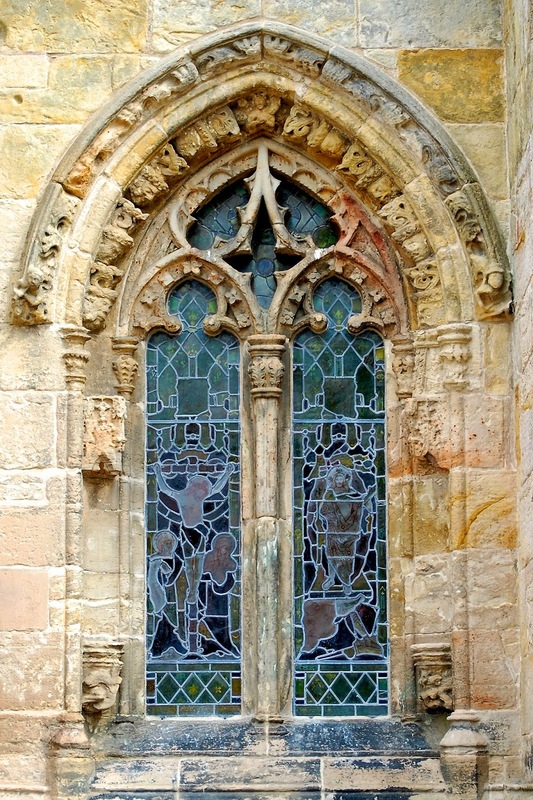 Eventually, some of the religious artifacts held by the Templars were hidden within or beneath Rosslyn Chapel. What are those supposed relics? Perhaps the Holy Grail or even the body of Christ. 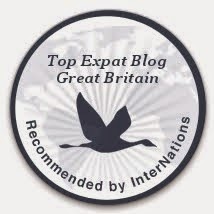 I simply can't do justice in a mere blog post to the many scholarly and conspiracy theories which abound. You can find plenty with simple internet searches, as well as books, novels, treatises, etc. The chapel's exterior is decorated with numerous carvings. Unfortunately, the chapel was built with sandstone and those carvings have taken a beating over the centuries from erosion. 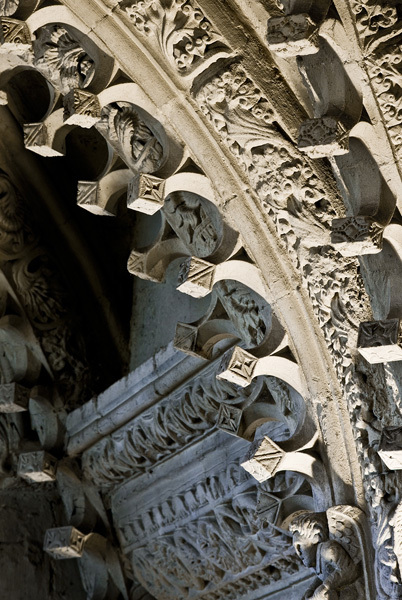 The pinnacles of the chapel's flying buttresses are lavishly carved. The blackening is a remnant of coal pollution during the Industrial Revolution. 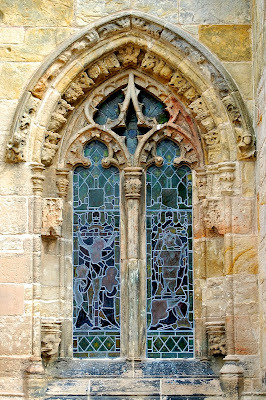 Each window has its own unique design and carvings. One of the waterspout gargoyles. 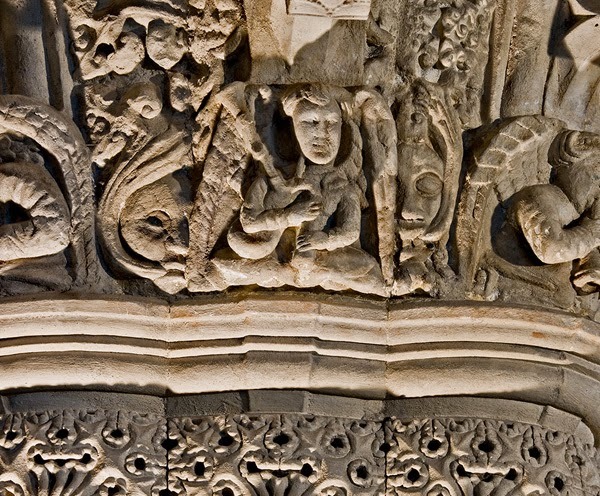 Given its thousands of disparate carvings, Rosslyn Chapel is rife for (mis)interpretation. The St. Clair/Sinclair family has retained possession of the chapel since its founding. 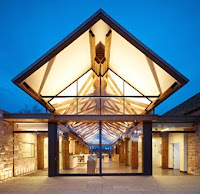 They currently allow no photography inside the chapel, so the pictures of the interior shown here are from their web site for the chapel, unless otherwise noted. Among the many highlights inside the chapel is the Apprentice Pillar (or "Prentice Pillar"). According to the story, the master mason received from William St. Clair a model of the pillar he wanted. Before the master mason would work on it, he wanted to travel abroad to see the original pillar. The story is vague as to where that pillar was located. While the master mason was traveling, the apprentice mason had a dream of the pillar and completed it before the master mason returned. It was better than anything than the master mason could do himself. Growing jealous when he saw the column, the master mason took his mallet and struck the apprentice mason on the head, killing him. The master mason was then executed for his crime, and his face was carved into the chapel and forced to stare at the apprentice's pillar. Unfortunately, this story first came about in the 18th century, hundreds of years after the completion of the chapel. It's a truly beautiful and striking pillar, with dragons ringing the base, vines and leaves wrapping upward around the pillar, and foliage at the top. I think it's the most accomplished carving in the chapel. 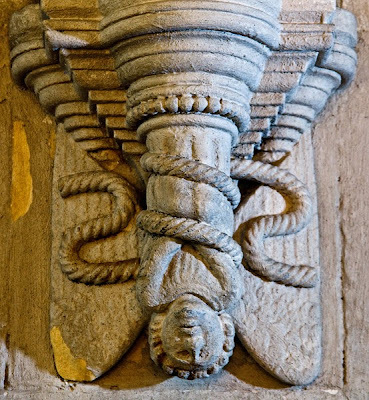 "Lucifer," fallen angel upside down and bound with rope. Then there are the many "Green Men" — more than 100 — who are scattered throughout the building. These are ancient pagan symbols of fertility and growth, with vines exiting the mouth showing unity between nature and man. 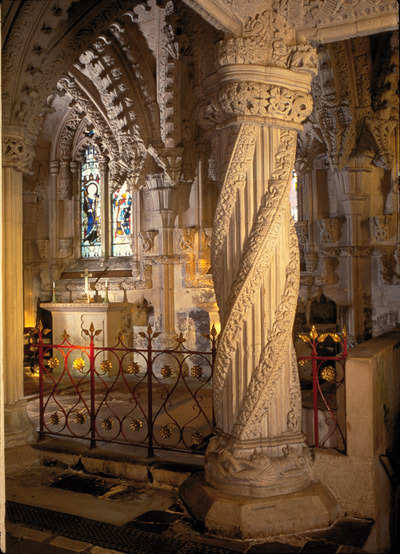 Rosslyn Chapel is a nominally Christian space immersed in Masonic and Celtic images. 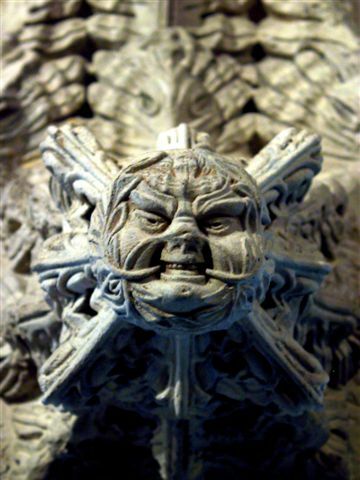 Green Man, photo courtesy of Wikipedia. Bass drone pipe off to the side of his head, tenor drone tucking behind his head, bag under his arm, chanter in his hands, but no blowpipe for the mouth. I also must mention the 213 cubes or boxes. Sticking out from arches and pillars, these carved boxes have a variety of patterns on them which many people think bear a code or set of instructions. What do they mean? As yet, no one has shown a definite pattern or interpretation. One recent interpretation is musical notes, and a "Rosslyn Motet" — not a good one, incidentally — has been composed from it. 213 of these little cubes? They gotta mean something! We spent nearly two hours at the chapel, wandering inside and out. It has a newly-built visitor center — you can see the Masonic influence — with nifty displays. It's state of the art with interactive computer displays. Our visit to Rosslyn Chapel was on a weekend in the summer, which meant it was crowded. So crowded, in fact, it became almost claustrophobic. With hundreds of carvings throughout the building, there aren't just a few locations that draw all the attention. Consequently, people stop and stand willy-nilly without regard to allowing others to pass, making it difficult to maneuver. It was even harder for Kate, who had Jackson on her back in a hiking backpack — great for keeping him contained but hard to navigate without bumping people. I look forward to returning on a weekday in the fall or winter, when the crowds will be small and I can have more time to study the carvings. It is one of the most unique chapels/churches I have come across in Europe. What do you think? Have a nagging suspicion that the conspiracy theorists might be right? Of course the conspiracy theorists are correct. Dan Brown and Hollywood would never lead us astray! And as you said, it is more fun to believe in the possibility. Dan Brown is just the latest in a long line of folks proposing theories and spinning yarns about this chapel. It's a tradition that goes back hundreds of years. Where there's smoke there must be fire, right?